Morse Decoder is an Android phone apps to decodes Morse code characters through the built-in microphone of your Android phone. Morse Decoder can be used by Ham Radio operators or anyone else interested in decoding Morse code from a Radio or any other device. Morse Decoder includes a “waterfall” to show a frequency spectrum of about 50Hz to 2300Hz. A narrow band DSP filter can be set for the frequency of the Morse code tones by tapping the waterfall. The DSP filter is followed by an automatic gain control (AGC) to compensate for changing signal strengths. 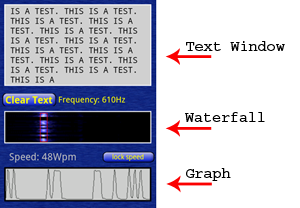 The detected signal will be shown as a graph and several algorithms will then detect the speed of the Morse code and convert them into readable text. 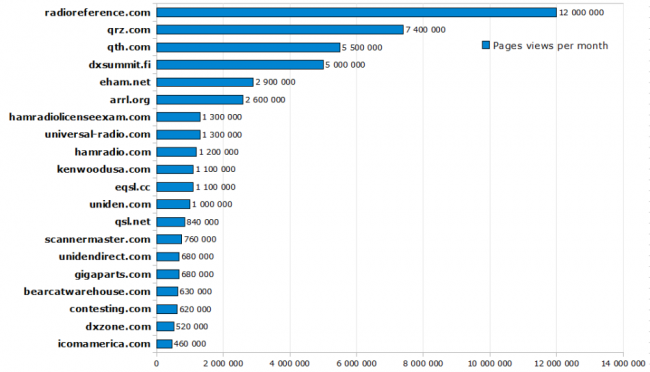 Speeds of less than 4 Wpm (Words per Minute) to more than 50 Wpm can be decoded. Place your Android phone against the speaker of the radio or the device which transmit the Morse code. If there is a tone present the waterfall will display a blue or white vertical line (As stronger the signal as brighter the line) Slide the red rectangular on top of the vertical line. Even though Morse Decoder uses a 200Hz wide AFC (automatic frequency control) it is recommended to move the slider always on top of the vertical line. It may take several initial characters containing both dots and dashes before the WPM speed estimation acquires the actual Wpm and decodes the characters correctly.